Hi Geoff so how did you get into furniture design? I started a classic joinery apprenticeship in New Zealand in 1985 and completed that training by 1990. I then went onto work for many different people and finally found myself in the wood reclaiming/recycling business by 1995. I Continued that for three more years before coming over to London in 1998. After working for many different people, I again found myself in the wood reclaiming business in Hoxton. So I set my current workshop up in 2009. The name Re-fuze came about as part of finding stuff that would too far gone to repair but could be taken apart to make something new. But the answer to your question really is: I’m just drawn to making and experimenting with different materials and I’ve always found it important to make what I want, rather than buy it. And that has become my business. 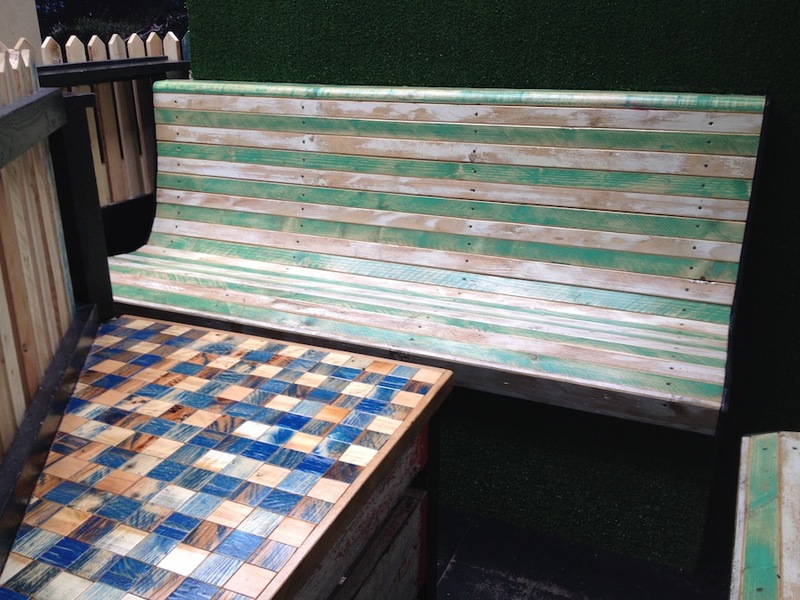 You prefer to work with sustainable, recycled sources… what inspired you to take this approach to working with reclaimed materials? Without giving away to many secrets where are your favourite places for picking up prize junk? I call it Hackney Builders Yard. Basically the mean streets of Hackney. It’s surprising what is available if you know what you’re looking for. I also have a few people I buy off for some bigger jobs. What were the ideas behind the furniture you built for us here at Superstore? I was sitting on these banquet seats in the mezzanine area and looked up through the skylight and thought, outdoor space, indoors. Then the banquet became park benches. 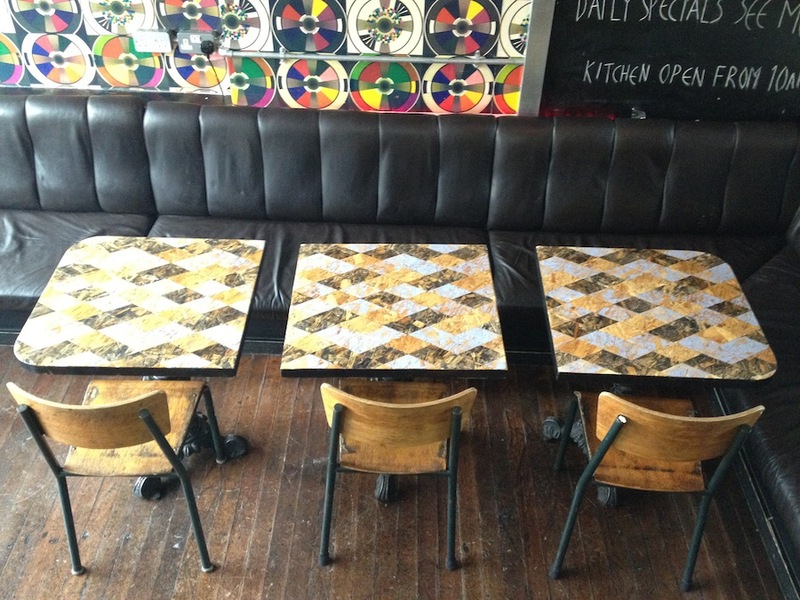 One of my ideas for table tops is to recreate classic textile designs using wood. So the table in the mezzanine became a picnic table cloth. And what better way to finish off a picnic area, than a picket fence. The table design in the bar area I like to call ‘Diamonds In The Rough’. The three at the front are argyle patterned and pushed together I call it ‘Snake Belly’. The blue and red one is called ‘Queen Of Clubs’ and the other rough one at the front is call ‘Diamond In The Rough’. Any other exciting wood adventures you are involved with?